And it all starts with a card base in Wisteria Wonder, with the bottom corners rounded with my Corner Chomper. Next is a layer of white card stock that’s been dry embossed with a brick pattern. The edges have been distressed and inked with Wisteria Wonder and the bottom edges, again rounded. Then I stamped the various sentiments in Rose Red and added little heart-shaped rhinestones to the words “love” replacing the “o”. 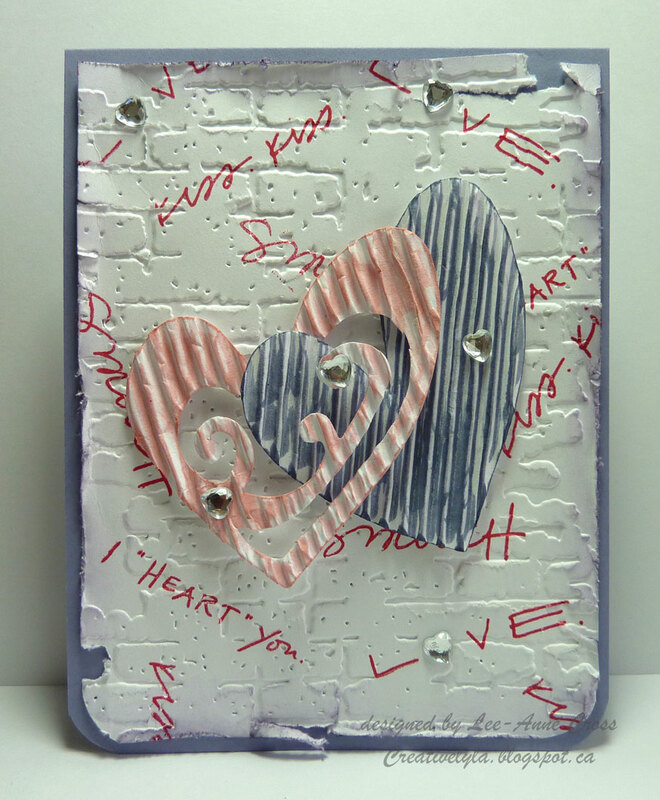 I cut the two hearts from corrugated card stock with the Tim Holtz Heart Wings die, then inked them with Pink Pirouette and Wisteria Wonder. Added a few more rhinestones and done! Easy peasy…quick as a wink! Hope you are not getting tired of Valentines…it’s where my head’s at these days…so brace yourself…you may see a whole lot more before February 14th :)!!! Great texture and love the brick EF in the BG.